Often found in aged Alpine, Grana, and Gouda cheeses, where do caramelly notes come from? The exact origins of caramel flavor are still being worked out. However, it seems to be linked to certain classes of compounds referred to as furans and furanones. In the broader food industry, these compounds are hallmarks of heat-treated foods and Maillard browning. In cheese, it’s thought that these compounds originate via microbial metabolism, with Lactobacillus helveticus being a likely culprit. Examples of these compounds include: 4-Hydroxy-2,5-dimethyl-3-furanone (furaneol), 4-hydroxy-5-methyl-3[2H]-furanone (toffee furanone), and many others. The usage of “sweet” in the cheese sensory realm can get confusing. I’ve heard sweet refer to cheeses that are low in acid (Colby vs. Cheddar), cheeses that are very milky in character (Mascarpone), and also cheeses that actually taste saccharine (aged Gouda). Again, the latter seems to be linked to Lactobacillus helveticus. L. helveticus is quite proteolytic, which means it likes to break down proteins. Since proteins are made of amino acids, that means proteolysis can result in amino acids. Amino acids, and their byproducts, can be sweet in some cases. In fact, the high intensity sweetener aspartame (i.e. Equal – the blue packets you put in coffee) is just a dipeptide of phenylalanine and aspartic acid. A dipeptide is just a fancy word for two amino acids linked together. The astute reader may realize that this is also the origin of why these cheese types often have tyrosine crystals! As more protein is broken down, more amino acids are formed. Tyrosine, being one of them, will eventually crystallize out. The same can also happen with leucine, but it often doesn’t get as much press. 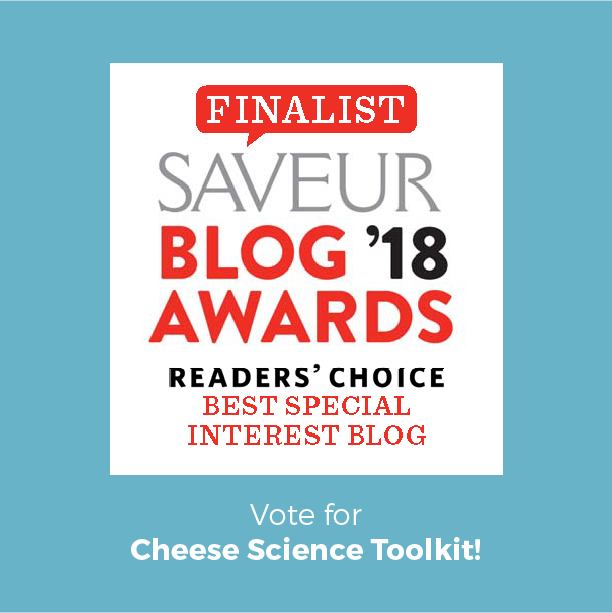 Cheese Science Toolkit (this blog) was nominated for a Saveur Magazine Blog Award! I started Cheese Science Toolkit while waiting for a flight in the Orlando airport. Three years later, I never thought it'd get this much attention! You can click here to vote! Click the image to vote for Cheese Science Toolkit!